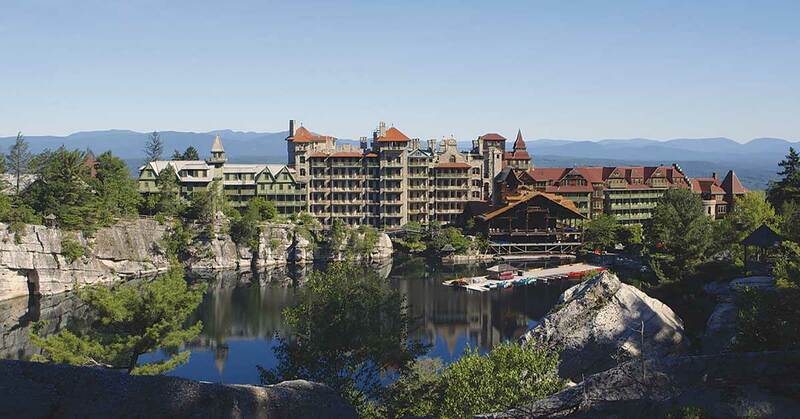 Deep in the woods of upstate New York, an old and peculiar hotel stands shrouded by hundreds of acres of the Mohonk Preserve and the Shawangunk Mountains. The nearest civilization is miles away. It is here, where even the loudest screams are swallowed by acres of dense forest, that 11 not-so-lucky individuals were selected for a week of pure terror. Well, perhaps it wasn’t quite so terrifying. There were a few chills, but mostly the week was about learning and fellowship. There were even some laughs. In June, Shudder, the AMC-owned online service devoted to horror movies, debuted Shudder Labs, a weeklong retreat on the art of the scare for 11 amateur horror directors personally selected by the Shudder team. These 11 Shudder Fellows and their instructors gathered at the Mohonk Mountain House in New Paltz, N.Y., a location so perfect for horror it’s surprising no one has set a movie there yet. The idea for Shudder Labs came from AMC Networks president and CEO Josh Sapan, who’s been a champion of the online service. Sapan came up with the name Shudder Labs, then handed it off to Shudder curator Sam Zimmerman to see what he could do with it. Inspired by other institutes and programs, Zimmerman created a retreat to nurture the next generation of horror filmmakers. Using press releases, social media, and calls to film schools and communities, Shudder spread the word about the event, ultimately receiving about 400 submissions. From there, Shudder chose the 11 filmmakers who would comprise the first class. The winners received paid travel, accommodations, sessions with horror veterans, and a few goodies like donated copies of Final Draft screenwriting software. Each one also got a $5,000 grant and a yearlong mentorship with a horror veteran. One selected filmmaker was Joshua Erkman, a 37-year-old Los Angeles resident and University of Southern California graduate. Besides being a horror fan, Erkman is the drummer for L.A. punk band Lamps. Horror has long held a fascination for him: When he saw The Texas Chainsaw Massacre as a teen, its bloody gruesomeness turned him into a vegetarian for a decade. While he returns to the classics, such as The Shining or Rosemary’s Baby, he’s a fan of new directions in international horror storytelling like Angst and Der Fan. He likes how Gerald Kargl, the director of Angst, created a special type of camera rig to capture the killer’s point of view. It shows possibilities in horror that don’t work in other genres, he believes. Sessions at Shudder Labs brought the group through preproduction to production, teaching them how to work with a crew, for example. Attendees learned make-up and effects, as well as how to get funded through Kickstarter. The group screened the movie Habit, the first feature from Larry Fessenden, the program’s director-in-residence. Made on a shoestring budget, Habit has an independent spirit and was filmed mostly in the Lower East Side of Manhattan in the mid-1990s. After the screening, the group talked with Fessenden about the triumphs and struggles of going it alone. The online service created to appeal to millennials finally feels like it actually has them in mind. AMC and IFC bring hit shows to Sling TV.